Photography by Jay Rubinic, Rubinic Photography, Inc. 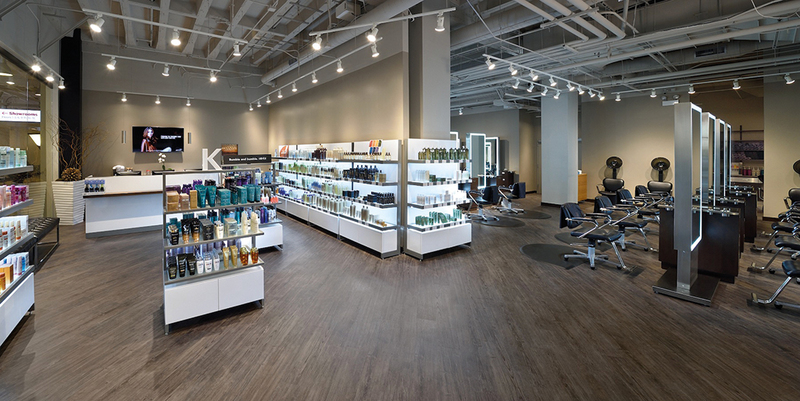 Founded in 1986, Thomas West Salon maintains an intense commitment to providing the highest level of service possible, doing so in a friendly, relaxing and comfortable environment. 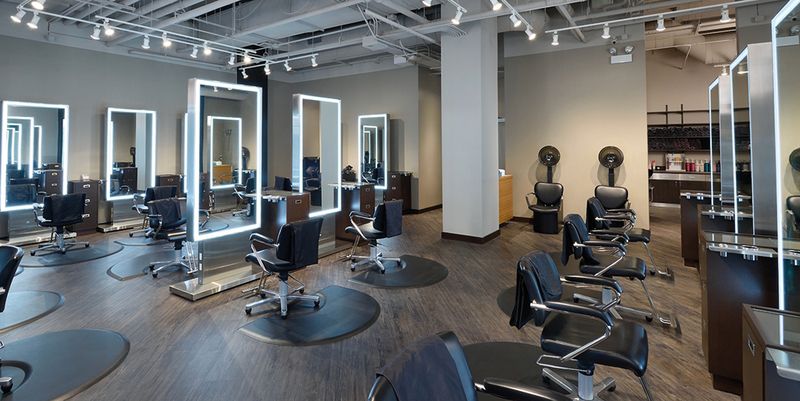 Located in Chicago’s Merchandise Mart, home to NeoCon, North America’s largest design exposition and conference for commercial interiors, Thomas West has become one of the premier salons in Chicago. 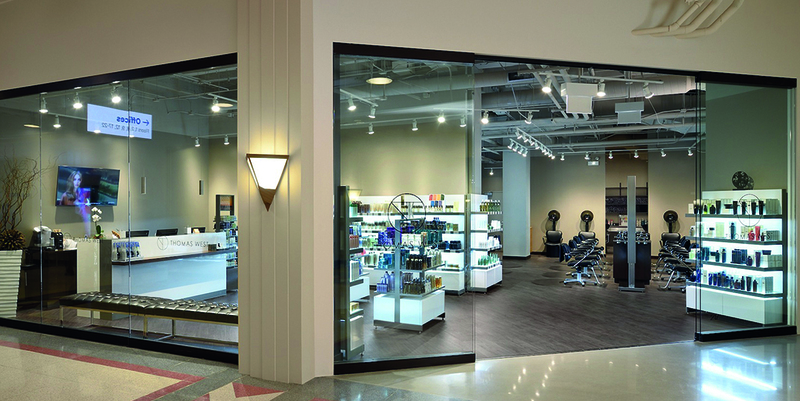 When the salon moved to a new location in the building, the team looked to Aspecta for a flooring that could step up to the demands of a busy salon environment with both style and substance: a strong design factor coupled with ease of maintenance; a no wax/easy to clean floor that also offers comfort under foot. "Our ASPECTA flooring is magnificent. It is so functional. Everyone raves about it – staff and customers alike. It gives the space that rustic yet sophisticated look, but it also hides the dirt really well. Maintenance is fantastic, so easy to clean, very simple." Style: Aspecta Five in Summer Pine - Charcoal lends drama, accentuates salong fistures, frames the décor. Care & Maintenance: No-wax floor is easy to clean. Tiles can be replaced if need be. "Aspecta is a great looking product that, as a designer, I really went for – the charcoal theme of the Summer Pine flooring punches off nicely against the black equipment. But for a salon, it’s all about the maintenance too. You have foot traffic from customers, people cutting, styling and coloring hair all day long, using all kinds of products and chemicals, and there can be spillage. I was looking for a floor that would hold up well to all that and still look good. For me, it’s mostly all about the design, but you have to factor in how it’s going to function. Aspecta has it all. 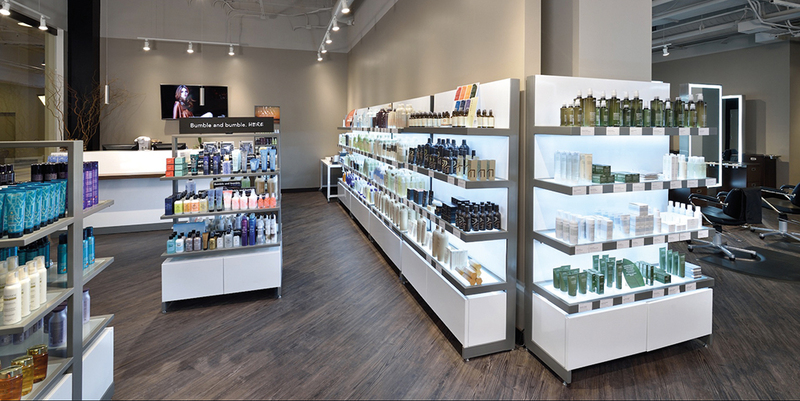 “The salon stations each have to be constantly, easily and quickly maintained, and Aspecta is perfect for that. And if something happens over time, the LVT planks are easy to fix: just pull up a few and replace them."